P.6 Work: Work has been carried out on writing an ending to the Snowman video and inviting St. Teresa pupils to our school. As part of E.M.U. Mr. Gray's P.7 class went to Castleward with their link class from St. Teresa's. These pictures showed them dressed up. I like the picture of Andrew! Now I'm a new first year stude. And how to obey the rules. I was one of the oldest girls in infant school town. We'll send someone to meet you at the school gates. From Michaela. Hope you can come . Elmgrove will always have special memories for me. In P7 good and bad treats or detention. D anny Champion of the world. The author of the film is based on Roald Dahl. Danny and his father lives in a gipsy caravan. Because I can stay out later. We do not want our countryside polluted. Our children can not walk home from school because the dust is all over the place. The traffic was very bad because the tanks were all over the place. It is too noisy around this countryside. The smell is too smelly because I can smell it. It's time for me to say "Goodbye"
I'll not be leaving as a fool. From Mrs Holmes to Mr Gray. Dave Cooke started Operation Christmas Child eight years ago. The Samaritans Purse organisation runs this christmas box apeal so every year they have to send all the boxs to differnt countys . All the countys like Romania , Russia , Bosnia , and Eastern Europe Armenia . So one of the schools in the UK are helping rase boxes for this apeal . So Elmgrove Primary School is one of them and they have been doing this for three years . The first year they did this they raised 44 boxes the second year they got 137 boxes and this year they got 349 boxes . There was lots of people who helped do this christmas apeal and even people that did not know helped as well . All the things that they put in the boxes where things like socks, gloves,hats, toothpaste,sweets,soap talc ,toys,pencils and a little christmas card with a photo of themselfs and a letter to say that they would have a lovely christmas . They sent the boxes to all ages like 0 2 yrs , 2 to 4 yrs,5to 9yrs and 10 to 14 yrs when they put the boxes together they got a box and put wapping paper on and put the stuff into it and put the letter on it. Then what they had to do to get all the toys they had to ask some people for some old toys and gather up some of there own . And then when they got all the toys they needed they put them into the boxes and then put them into a big lorry and sent them of to all the poor people in all the diffiernt contrys . Then one day all diffiernt people from the operation christmas child came to Elmgrove primary school and put on a video and it told them more about this apeal . So I hope that you can give toys to the poor . By Stephanie and David . We were in group B.We thought that it was going to be boring but in the end it turned out to be very good.We went to DRUMALLA HOUSE from the twenty sixth to the twenty eigth.We went orienteering in Glenarif forest park,hill walking,fossil hunting and swimming.We were in dormitory one.Both nights we stayed up until about half three in the morning.Every night we watched a video. My monster has a hairy face and strange eyes. He has green teeth.He has a hexagonal nose and red cheeks. He has a blue ; square body with big red horns on his head and a red tail. He has four green legs and arms with four ears coming out. Everybody's leaving for the school summer holidays. Leaving P7's say their goodbyes to their teachers. Mr Gray watches us walk out the school gates. Goodbye Elmgrove, see you when we visit. Remember all the good times I have had. Our uniform we don't need anymore. Very long times we have spent in this school. Everyone's waving goodbye as they leaving for secondary school. Because I like playing in the snow. We know that you are unhappy but we will put a special chemical seal under the rubbish so that the water will not be polluted . We will put a bird scaring device to scare the birds away. There would be no turning back. I didn’t want to be late. And my teacher was always fair. And I must take the stride. But most of them were fun. And what you've put be through. 1. On Friday I went Ice - skating with my Youth Club . 2. On Saturday I went to Dixon park to play football with my sisters . 3. On Sunday I went to the cinema to see The Parent Trap . Because I can go to the beach . By Nicola & Natalie . Danny Champion of the World . The author of the book that this film is based on is Roald Dahl . Danny lives with his father Danny and his father lives in a gipsy caravan Danny had not been attending school before now because his dad was a qualified teacher and was teaching him at home . Danny 's dad works in his garage in the daytime and at night time he goes poaching . The landowner was Mr . Hazel and he wanted Danny 's fathers land to build a new town . I think Danny and his dad were popular because when they needed help people came to help them . Danny 's dad had to stop poaching for a while because he broke his leg . The poilce -mans excuse was that Willam had a leg injury . They sewed sleeping tablets to put the pheasants to sleep . When they put their plan into action they caught alot of pheasants . I would make a trap to catch pheasants so that I would not kill them . I know you think the quarry is an ugly hole . I know it may pollute your water however we are going to put down a special chemical seal. We are going to put a bird scaring deince . The quarry might be a smelly place beside your house. We know there is a load of traffic as your children walk home from school . We understand that you do not like the quarry beside your house. In thirty years time there is going to be a quarry park were people can go and enjoy themself . Lead the way so we can play. Get your trainers, lets go and play. Overall it's great teachers and all. Very hard work it's worth in the end. So I'd like to thank everybody. We went to Navan with the school and St.Johns came with us.I had a great time on the bus we talked and told jokes.It was a fun jurney.I thought the film was good and exciting.At the archaeology course the boys from St.Johns were talking and not listening to us to see if the answer was right.I liked talking to Robert Reilly about fishing.We talked about the fish we caught .When we eventually got to NAVAN we looked at pictures of Cu Chulain. The snowman lifted me up in the air I looked down and I saw the = fields . All of a sudden we where getting closer to the ground. We met his other snowman friends we played with them for about an hour. We flew home I played with him for the last hour and promised I would make him next year and we would have lots of fun again . Elmgrove I'll miss it all!. With a special break-time treat. Boy this is harder than I thought. Then line up in a nice neat line. And we will all go home at last. Then we flew up in to the cold air above us.The felids were full of snow. I could see my house from were I was. I looked down people were as small as ants. We stoped me and and the snowman were going down,down and down.We touched the ground . He uncovered my eyes .I looked around and all i saw was lots of snowmen.who are they i said. He said they are all his friends.I stayed for a while and we had a party. It was a lot of fun for all of us.Then i had to go home .I said good bye to the snowman and he vanished. I ran in .I ran upstairs into my room before anybody new. Miss McBride shouts, "Silence please"
1. On Friday I went to the cinema to see A Bug's Life . 2. On Sa turday I rented a video it was called War- Zone . Scared or excited, I don't know which. WE WILL SEND SOME ONE TO MEET YOU AND SHOW YOU THE WAY TO THE HALL. A place where teachers boss you about all day If you be good you'll be A okay. A brilliant person who helps you learn if you talk he / she will gurn. Children who just want to play. There really not that bad .Are they? Something that student's dislike, when they don't finish it teachers get uptight. What is break and lunch time? A time that's fun for everyone, when we have to go in it's really dull. On Monday 10th May people and families were waiting for the three o'clock train to Bangor. The people were waiting quite normally.The train approached at 2:58 exactly. The people took a step forward when suddenly they heard a loud screech the people gasped and took a step backward and and realised that the train wasn' t going to stop.The engine driver turned the siren on.The people knew that they were about to impact into the building.The people braced themselves tightly to the seat. Some froze others were rushing towards the rear end of the train.Ü€>  ,ÎSome people ran and called for help. SUDDENLY there was a crash luckily it only hit the building quite gently everyone had a sigh of relief. No one was badly injured only a few minor cuts and bruises. There was 64 people on board the train, they had come back from Bangor. They were all so happy that they were not involved in a terrible accident. 1.On Friday I went to a youth club in Bloomfield Presbyterian Church. 2.On Saturday afternoon my sister,my friend Stacey,my mum and I went to the cinema to see The Parent Trap. 3. On Sunday I went to the Prairy Inn to have my dinner because it was my aunties birthday. Because I like to go to the beach. The year had gone by I'd moved on to p2. Having stories read to us and watching T.V. Being in the play area making pretend cups of tea. To think I'll soon be old enough to drive! Working instead of going out with all our friends I think we will be glad when the test ends! We will be as happy as we were at Elmgrove Primary School. 1.On Friday I went to the cinema to see Madeline with my sister and our two friends. 2.On Friday night I went to a youth club at Bloomfield Presbyterian church it was good fun we played operation and other games. On sunny days you see lots of gulls. Because you can splash in puddles all day. ....and we sadly leave, having to say a final goodbye. 1 I went ice skating on monday. 2 I went to see my coisn camron . Thankyou for allowing us t0 come to the tree trail. Are class liked the play park fraiy much . Because I am very warm. 1 The author of the book is Roald Dald. 2 Danny lives with his father Willam . 3 Danny lives in a gigay caravan with his dad. 4 His dad thiching danny in t he caravan . And some famous people as well. Old fashioned, friendly and a happy place to be. The happy times we shared. Whats On? Athletics, Computer program, School tour. The bus was half an hour late but we still made it. We did not get to walk up the mound .Before lunch we did the Mystert Quest landscape quest and story quest and we had our lunch a then we. Went to look at the mound and we saw the biggest dog that lived and at the start we saw frog-spawn and our teacher Mrs Martin when she was talking to us the automatic doors closed on her. I can’t get used to saying goodbye to my mum. It’s not good but from to time I still hate school. I’m in p3 the work has started but it’s not hard. P4 is when the work gets harder but now I get used to being away from my mum. P5, 6 and 7 are all fun but the work gets harder still. 1 I played my Nintendo 64 on Friday after noon . 2 I went to the cinema to see the Prince of Egypt . 3 I went to chrunch on sunday . Ending now and when I look back such fun I had on my journey at Elmgrove. As we were flying through the skyI was holding the snowman,s hand.I was looking down at myfriends house it was really small. I saw all my friends making snowmen. Then we stared to get lower I was really excited.Then I started to make snowmen with my friends but there snowmen did not come alive. Then It was three o'clock I jumped I said my mum is going to kill me. Then we better go O.K . Then we got home my mum shouted at she said who were you with I was with the snowman I made yesterday WHAT he came alive. Get you up to bed but what about the snowman he can lie in the basment O.K. Then the next morning he had melted and I never saw him again. Elmgrove School is really good. Leaving I do agree much. Might take the bus to school today. Good morning I will say to the bus driver. Reading, Spelling, Maths and English that's what we do mostly. Very easy subjects but can be hard. Every day we will do something cool. Leaving this school is going to be the hardest thing I will have to do, also I will miss all the primary school teachers I've had in the past. My two sisters will be going into p2 and p7 I hope they enjoy Elmgrove as much I did. Glastry is the high school I will be leaving to go to, I hope I meet nice teachers but they won't be as nice as the teachers in Elmgrove. Running schools must be very hard but I know this school must be the best, all the teachers, helpers and the headmaster. Older and older we get as in the next 6 or 7 years or even more than that we will be leaving school to get a good job. Very soon p7's will be leaving it will be the summer holidays p1-p7 teachers will be getting a new class as another year goes past. Elmgrove is a school I don't think any other is as good as ours. 1. On Friday I went to Bangor and had lunch in burger king. 2. On Saturday I went to Ballet the teacher that teaches us is called Miss Julie. 3. On Sunday Laurie and I went to Sunday school. 1.Roald Dalh was the author of this film and book. 2.Danny lives with his father. 5.In the daytime he was a macaneck and at night he was a poacher. 6. Mr Hazel was the landowner and wanted Dannys fathers land because he wanted to build a town over it. 7. I think they were popular because lots of people liked them. 8. William stoped poaching for a while because he bork his leg. 9. The excuse that the police man gave to Mr Hazel was that Willam fell down stairs and bork his leg. You come to school on your first day making friends and having fun. You are in p2 you have a new teacher and more work to do. In p3 you have lots of fun and play outside with your friends. Now you are in p4and you have made some new friends. In p5 you have more work to do and lots of homework. You are in p6 and you learn something new every day. Sunday was sunny it was so hot. But Monday was rotten cold not hot. Tuesday was rainy still no sun. Wednesday was snowy everything white. Friday was stormy no more electric. Saturday thunder but tomorow is Sunnyday. I was right it was sunny all that week . I got a tan and so would you . No shoes on any feet only sandals. OUCH I said walking along the floor. NO WAIT NOT ANOTHER ROTTEN week. So many people, can my friends be found? I love this school hip-hip hooray! I usually had all my work done. To sum up, I've had a blast! The snowman grabbed my arm and started flying in the sky. We flew past a white field. The houses looked like a big ant and the people looked like small ants. Then we got to the cold North pole. There were lots of other snowmen and it was a snow mans birthday. and we played goodgames. And we played snow ball fights. Then we had some food. Me and the snow man started flying again. We crashed the snow man banged his head .And the wind was very blowy .He tryed to fly but we fell again We were right infront of my house. I said do you want to do it tomorrow . My mum saw me and she told me to go to bed the next day he melted. Next Christmas I built him again. 1 .He cant run because he has a bad leg. 2.The boy was afraid of the bull. 3.Several cows were grazing in the field. 4.They have done everything I asked them to do. 5.James is a very kind boy. 6. I have never saw an eclipse of the sun. 1.Three people seen the accident . 2.Sarah did her best to tidy the garage. 3.The book is kept on the shelf. 4.Philip rested when he had done his work. 5It is the biggest trout I have seen. 6.The books are kept on the shelf. Every day we have to go to school to learn to read and write. Young children will be starting Elmgrove in September, travelling the same road we did. I know that I have really enjoyed being at Elmgrove it is so sad that I'm having to leave so good luck to the Teachers and all my friends. Elmgrove is my primary school which I will always remember. Lots of good memories at Elmgrove which I will never forget. Mr Gray is my p7 teacher who I've liked a lot. Raging teachers who shout at bad boys and girls. Our work has improved through the years. Everybody from p7 is leaving Elmgrove and I'm gonna miss it and all my schoolmates. As I was watching the trains go by to Antrim suddenly another train came down towards the train to Antrim and everyone was panicing and the trian could not stop. They both banged in to each other and I ran to a phone for help. The ambulance came and people had to go on the ambulance and everyone had to get out because the train was burning and children were crying. Some parents were too. The train driver. said children and women first. 1.Monday night I went to Disco danceing Igot lurnt a new solo. 2.After Disco Danceing Iwent to my granny and granda's house. 3.My mum and dad went to Dublin and I had to go to mygranny and granda's house to stay. Mr.Gray Elmgrove, Elmgrove how I will miss you? Going to a new school will it belike going back into P1. Elmgrove, Elmgrove how will I do in my new work and what about P.E. and all my old teachers too, so what will I do? Elmgrove, Elmgrove so this is goodbye I think I do not like it, do you? I hope my children come here too. The Romanian team hit frist place gold. Russia's Svetlana Khorkina, who made an uncharacteristic mistake in her performance, show her nervousness [ left and below] and later look back at the Victorious Romanian team.The next Olympics will be held in Greece. We pick Gymnastics because it is fun to do. And I like the swing to . All the a even`s are good to watch. The winter Olympics well be held in two year`s. I hope you and your wife are alright, and Rudolf too. I will leave you out a glass of milk and chocolate cookies and a carrot for Rudolf. I liked the presents from last year. Please may I have a Bunny rabbit doll, a game called Squid, a porcelain doll and a Barbie. I am in P5 now. My teacher is called Mrs Martin, I am nine years old. I have one brother one sister. I am nine years old. I go to Elmgrove Primary School. I love the things you got me for Christmas. Is the fish alive? I hope you can come and see me and mum, Dad and Kerry-Ann. I love you. Will you come and stay for a Week . We always get a lovely treat. We get no treats and that is sad. And practice every day and night. And in the shop you can get some pencils. The teachers even sing along. You had when you were making this rhyme. Then the first thing I knew I was flying through the thick icy air.His hand was terribly cold but it was fabulous. It was a beautiful sight. All the trees were covered in snow and the fields were too. The people were like little beetles and you could hardly see them. It was the most outrageous thing I had ever seen. The only thing that puzzled me was where we were going. I asked the snowman, and he told me that we were going back to my house. When we got back to the snowy ground I told him I had a wonderful time. Then suddenly the chimes started ringing and this colourful light flashed upon him and he stopped moving. So I went back to bed and waited till the next day. The next day the same thing happened. He woke up and he came into my house and we both had something to eat. Then suddenly my mother and father came down. So I quikly threw him into the coboard. My mother and father came in and said what's that mess on the floor (It was because of the snowman) so I just made it up and said I just spilled some water. When I got the snowman out of the coboard we went to the park. Flying threw the air the snowman bashed into a sighnpost and diappeared. That was the last I saw of my wonderful friend. I hope you are all right in that weather. Is Rudolf and all the other reindeer all right because you couldn't come to my house without a reindeer? How are you? I am fine. I hope Ginger Spice is talking to you because I'm missing her and I'm hoping she will come back. My name is Amy Wilson and you're my favourite Spice girl. I play a cornet and my family play other instruments and people call us the musical family. I've got all your CDs. My school is Elmgrove Primary School and my teacher is called Mrs Martin and she is the best teacher that has ever taught me. I hope you'll write back soon. This is the St Teresa's P6 classroom. I thought it was very small but colourful. We played games in the P.E hall . We played through the hoop. We got a tour around the school .We had lunch in the P.E hall . At break and lunch we went out to the play ground to play. We had a great day. This is ST.Teresa`s Primary School. It is on the Glen Road. P6HL went their for a trip to find out who our pen pals were. This is ST.Teresa's assembly hall. They do most of their school plays here . There is a door at the back of the stage which the actors come in. We were at St Teresa's on Thursday 11th November, 1999. We met our penpal. My penpal was called Bronagh. In their school we played pass the ball and in the photo it shows Roy, ChritopherM, ChristopherH, Lyndsey L, Debbie-lee, Nichola and Amy. This photograph is of the Glen Road that St. Teresa's school is on and outside their school there is a walk over bridge. When you are in their class you can see all the cars going past. This display was typed on the eMates by Toni, Kirsty, Roxanne, Debbie-Lee, Kristine, Roy, AndrewB and ChristopherH. In this photo we were playing a game where you had to hit the other person with a roll of newspaper. When you hit the person you had to put the roll of newspaper in a red box before the other person hit you. It was brilliant. This is Amy playing the detective game. She was very good at it ,although it was very hard. You had to guess who the leader was who was making everyone do actions. This is Amy and Caoimhe. They made friends when we were playing a game. They are doing a What You Like sheet. This is everybody playing Chinese Whispers . You had to pass on what the person beside you said. On our visit to St. Teresa's we played games and they gave us a tour of their school. They had a very big school and a very big playground. My partner is called Michelle. She has brown hair and she wears glasses. St. Teresa's pupils designed their own Viking shields. You can see these in the photo. We all did quizzes with Michelle and John. We had to write what our favourite food, pop groups were and did we have a pet. St. Teresa's pupils had to wear their uniforms but we could wear a track suit. We had our lunch there. We played a game where we had to throw a ball to each other and another where we had to clap our hands then the next person beside you had to clap. We also played two other games and my favourite was the one where we had to hit someone with a newspaper then run round in a circle and sit back down in the person who hit you with the newspaper's place. We went home in a coach at three o'clock. We were visting St.Teresa's on Thursday 11th November 1999 . We met our pen pal and we were finding out about each other by writing what food we liked. This photo is of Stacy , Lyndsey and me. This photograph is of St. Teresa's hall. We are playing a game where you go though the hoop. In this photograph you can see Christine, Amy, Caoimhe, Gary and half of James! St. Teresas When we went to St. Teresa's we played a game called Chinese Whispers. It was funny because we came off with such silly words. 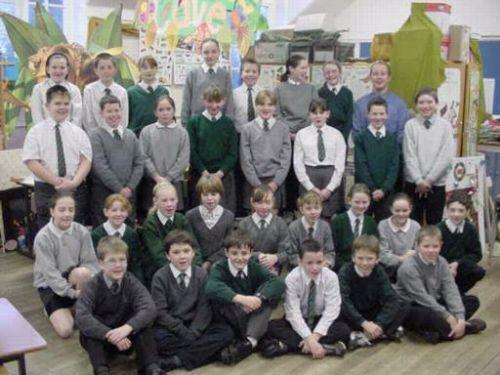 This is half of our class and half of their class in St. Teresa's P6. classroom. This is Andrew Loughran and Christopher Morton playing a game holding hands and climbing through the hoop. This is Roy Dillon and Christopher Murphy in a room and behind them is our Bill Board which we made for them. It was all about our area and our school. In St. Teresa's Primary school we went into their Assembly hall. This picture shows James Bennington and Marc Ricthie with Christopher and Gary learning more about each other. This photo shows Stacy Henderson, Roxanne McCrum and Lyndsey Letman learning about each other aswell. The start of the day did'nt start so well because the bus was late . Finally the bus came and we all got on . My partner was Chelcie Owens . It took a very long time to get there.When we got there we had our break . When we had finished St. Johns and us went to the Mystery Quest and got told about The Navan Dragon . It was very interesting. After that we went to the archaeologists workshop .We had to go with our partner and two St.Johns boys.After that we had our lunch. We then went to a shop. After that we saw a mound. Then we went to a cinema we saw four sences called The Naming of Navan, How Cuhulain got his name ,Deirdre and Naiose and The Cattle Raid Of Cooley.My favourite part was the cinema. Last week we went to Navan Fort. The bus was a bit late but apart from that it was briliant. I sat on the bus with Cheryl my best friend. I shared my mints with her on the way. When we got there we went into the Navan center. First of all we had our break then we went into a small room and watched a sort of video. At the end of it a dragon breathed smoke out of it's nose holes. It was very spooky. Then we went into the archaeology place and we did'nt get to see the biggist dog in the world. After that we went to get our lunch I was the last one in my class to fininsh my lunch. Then we went to the shop and I bought a pencil , pen and a note book. After we went to see the mound because the bus was so late we could'nt climb the mound. Then we went to the bus and we got on it. Me and Cheryl sat beside each other on the way back.